Exceptional sound quality and aesthetically pleasing design were the key reasons why DPA microphones were chosen to provide amplification during the Inauguration of Michael D Higgins who was recently sworn in for a second term as the President of Ireland after re-election in October. 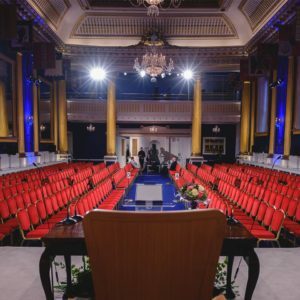 This prestigious event, which was held in the State Apartments of Dublin Castle on November 11, was attended by more than 300 people including former presidents Mary Robinson and Mary McAleese, the Taoiseach (Irish prime minister) Leo Varadkar and Tánaiste (deputy prime minister) Simon Coveney. Ion Solutions, a leading provider of professional Audio-Visual and Broadcast Technology Systems in Ireland, was tasked to supply the sound systems for the Inauguration by the Office Of Public Works. Ion Solutions specified four d:sign™ 4098 gooseneck microphones mounted on table stands. The directional (supercardoid) polar pattern of these microphones, combined with their natural sounding off-axis response, ensures that they deliver exceptional spoken word clarity while still attenuating ambient noise. Ion Solutions also installed four slimline directional Modular Active Booms, each fitted with a 4018 Supercardioid capsule. Ion Solutions has an extensive stock of DPA including many d:vote™ 4099 Instrument and d:fine™4266 Headset Microphones. After the Inauguration ceremony its 4098s were immediately sent out on another rental – this time to the Fine Gael Party Conference, which also took place in Dublin.